The Ultimate Fighter has been chugging along for 27 seasons now. Some have been fantastic; others were not so much. But the original cast of characters from “TUF 1” still holds a special place in MMA fans hearts. The UFC has been working overtime as of late compiling a ton of new content in lieu of the promotions 25th Anniversary. 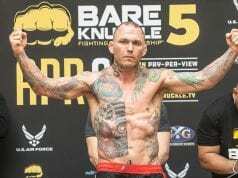 One such program will feature a where are they now style documentary revolving around the original cast from the groundbreaking first season of TUF back in 2005. Only Josh Koscheck, Lodune Sincaid, and Jason Thacker missed out on the “TUF 1” reunion. All of the other fighters and coaches from the inaugural season took part in the get-together. Retired fighter and “TUF 1” cast member Mike Swick shared an interesting side by side comparison photo via social media. “TUF 1” middleweight winner Diego Sanchez is the only fighter still competing inside the octagon 14 years later. Although, a number of other fighters and coaches from TUF 1 are still active in the sport. 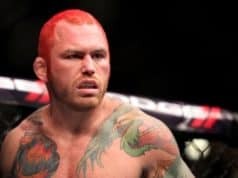 Namely, Chris Leben who recently came out retirement to fight Phil Baroni in a bare-knuckle boxing match later this year. The Ultimate Fighter franchise may be coming to a close, but the original cast from season one will always hold a special place in MMA fans hearts.